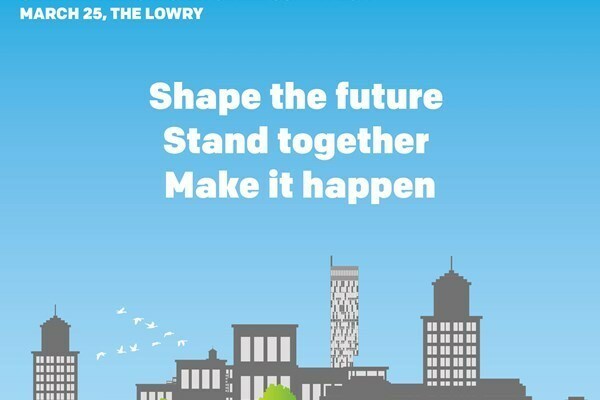 March 25th at The Lowry in Salford, saw Mayor of Greater Manchester, Andy Burnham, welcome around a thousand guests to the 2019 GM Green Summit. It was a wonderful opportunity for individuals and businesses from across the region to engage with the sustainability agenda, hearing from local government officials, as well as various organisations, to discuss planned action to move towards Manchester’s 2038 carbon neutral goal. The day began with Cllr Alex Ganotis and Andy Burnham outlining where we are currently and what we hope to do next. A pre-recorded message from HRH Prince of Wales even featured, with him stressing the importance of city regions such as Greater Manchester leading the way to the ‘zero carbon future, that we so urgently need’. Using data from the Tyndall Centre, pathways were set out as to how Greater Manchester will live within its carbon budget, moving towards our 2038 carbon neutrality goal in accordance with meeting our fair share of the Paris Agreement. Although, throughout the day, the focus was not so much on the 2038 target, rather the scale of the reductions that need to be made from now until then. Annual average greenhouse gas reductions need to be at 15% per year, starting now, with the most significant cuts needing to happen within the next 5 years. Feeding into this was the announcement of GM’s 5-year plan, designed to enable the area to prosper socially, financially and environmentally. Major challenges have been considered in the formulation of this plan, including – mitigating climate change, air quality, production and consumption of resources, natural environment, and resilience and adaptation to the impacts of climate change. for key air pollutants at the earliest date. waste by 2035 and reducing the amount of waste we produce. implement and achieve environmental net gain. It was noted throughout the day that delivering these ambitions will be challenging, and our 5-year plan will involve new ways of doing things that everyone will need to get behind. Acknowledged, is there’s still a ‘gap between what we know we need to achieve, and what we believe is immediately possible’, as a city region. This has been criticised by some as an excuse for not acting fast enough now, however, the pace of change is more likely to speed up once the first changes have been made. The rest of the day included speakers from all sectors, discussing how these plans would be put into action on a practical level. Guests included Cllr Sean Fielding, Lindsey Chapman, Martha McPherson, Professor Carly McLachlan, Emma Howard Boyd, and Anne Selby along with a whole host of other familiar names from the forefront of their industries. Our own Co-Founder and Director of Advocacy, Phil Korbel, featured during a session on public engagement with the green agenda and spoke of how Carbon Literacy, in particular, delivers this crucial element of our road to a carbon neutral GreaterManchester (and society). We also had some wonderful discussions at our Carbon Literacy stall, particularly with the youth presence around how we can be reducing our carbon footprint now. To round off the day, Andy Burnham engaged in a panel discussion with Actor Peter Gunn from Coronation Street, and Mark ‘Bez’ Berry of the Happy Mondays, focusing particularly on fracking, and sustainability on screen. Thankfully, Greater Manchester has now officially declared a fracking ban as part of its plans to become carbon neutral. Dave Coleman, our other Co-Founder and Managing Director, then presented two Carbon Literate Organisation awards – one to Peter Emery on behalf of Electricity North West, the other to Cllr Derek Antrobus on behalf of Salford City Council. The awards showcase the commitment of both organisations to Carbon Literacy, support of their Carbon Literate staff, and to carbon reduction within their respective organisations. This was followed by a number of significant organisations who had been in attendance at the Green Summit, making pledges to meet the aims of Greater Manchester’s plan. The Carbon Literacy Project pledged to work with organisations to certify 5000 more individuals across GM over the coming year – a 50% increase in the current number of certified Carbon Literate individuals. At present, the total number of individuals being certified as Carbon Literate, across the UK and elsewhere in the world, is growing at a rate of 50% a year. This pledge will see us focusing on growth within Greater Manchester, whilst continuing to develop and support Carbon Literacy offerings in other cities, regions and countries. We welcome the challenge and look forward to completing this commitment with the cooperation and collaboration of organisations from across the city region.